Sheffield Olympic Legacy Park welcomed His Royal Highness The Duke of Gloucester on Tuesday 19 March to meet representatives involved with the project, which is transforming one of the most deprived areas in the UK. Sheffield Olympic Legacy Park is delivering a tangible legacy from the London 2012 Olympic Games through a combination of world-class sports facilities, education, new skills, research and innovation, environmental improvements and opportunities for the local community. An evolution of the Sheffield City Region Innovation District, Sheffield Olympic Legacy Park aims to place physical activity and prevention at the heart of the NHS, tackling key health and wellbeing issues affecting the nation. Dignitaries and representatives from the Park met with His Royal Highness as he was given an overview of the site. 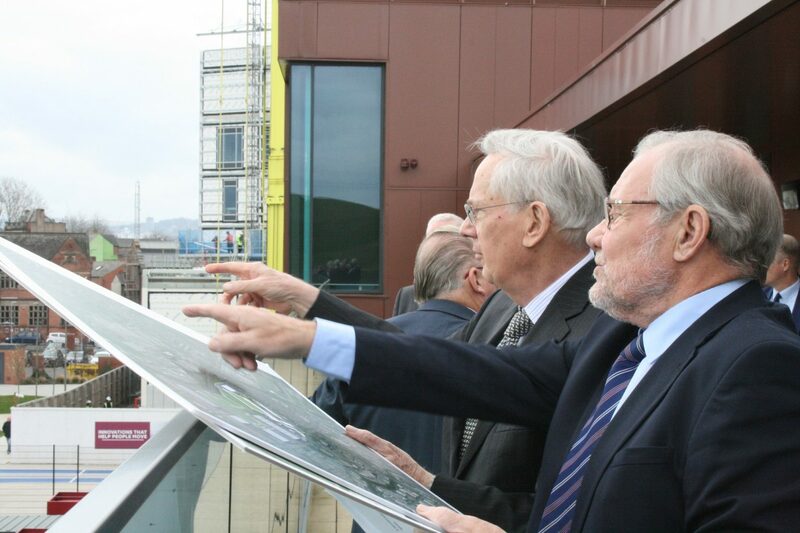 Former Minister for Sport and Project Lead for Sheffield Olympic Legacy Park, Richard Caborn, said: “We were honoured to welcome The Duke. “It was wonderful to show how we are delivering the four key themes from London 2012: Sport – improving infrastructure and providing access for all levels of ability; Community – providing opportunities in education, skills, training and jobs; Environment – enhancing the amount and quality of green space and promoting sustainable travel; and Economy – creating jobs and wider employment opportunities. Sheffield Olympic Legacy Park is being delivered by Legacy Park Ltd, a joint venture between Sheffield Hallam University, Sheffield Teaching Hospitals NHS Foundation Trust and Sheffield City Council. At UTC Sheffield Olympic Legacy Park – graded ‘good’ by Ofsted – students complete high-quality technical qualifications in computing, health sciences or sport science as well as GCSEs and A Levels to get the skills that employers and universities need. The UTC opened three years-ago and its three technical specialisms complement the health, wellbeing and tech focus of employers based at Sheffield Olympic Legacy Park. Councillor Olivia Blake, Deputy Leader at Sheffield City Council, said: “We’re very proud to demonstrate the excellence here at Sheffield Olympic Legacy Park to a royal audience and welcome The Duke of Gloucester to Sheffield. With partners across the city, we have created a truly innovative home for sport, education and research and it’s wonderful that this is being recognised.